I saw one of these being pulled along on a flatbed trailer the other day as I drove home from work. It even had the same “396” badge on the fender, meaning it packed big-block V8 heat. But I care less about the engine underhood than I do about styling — and I always liked the way these looked. I especially like the canted front end. I used to draw cars all the time as a boy, and I aped this front end over and over in my sketching. 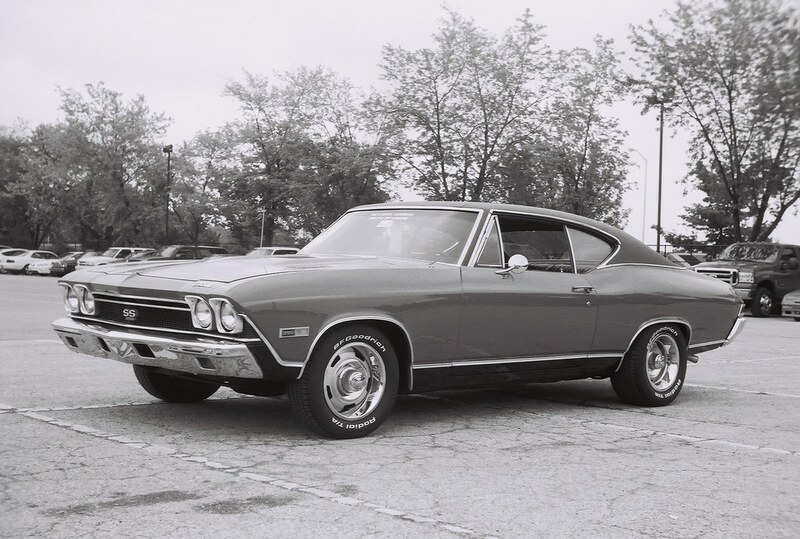 I took this photo at the Mecum auction in 2010, using my Argus A-Four on Fujifilm Neopan 100 Acros film. That Argus is a capable little viewfinder camera that I keep meaning to shoot again. I’ve owned two, and photos I took with both of them are in this Flickr album. What’s the 396 in reference of? Horsepower? Cubic inch displacement in the engine block. For you Metric system people, a 396 is about 6.5 liters. I always preferred the 69 version of the Chevelle. Either way, nothing quite like the deep, throaty rumble of a big block V-8. Got a similar comment over on Facebook. Apparently the ’69 version of the 396 got 25 extra HP. I’ve always liked American mussel cars, I often watch show’s like Fast N’ Loud on Sky TV, thanks for sharing Jim and nice photo btw.